ED160: Kobelco continues to innovate with next phase production of unique dual purpose excavator - Kobelco Construction Machinery Europe B.V.
As Kobelco Construction Machinery Europe B.V. (KCME) prepares for BAUMA 2016, the world’s biggest construction exhibition of its kind, the company is pleased to announce the next production phase of the ED160 – one of its hero machines. The Kobelco ED160 Blade Runner is a unique industry concept; it’s fitted with a large tilt-angle dozer blade, which enables it to cover a wide range of applications including landscaping, digging, pipe laying and backfilling for maximum versatility, productivity, durability and high performance. The ED160 Blade Runner’s six-way dozing blade can move large volumes of earth and has Power, Angle and Tilt capability (PAT), which is operated from the cab with a single control lever. It is foldable for easy transportation and has heavy duty blade bracketry to cope with the most demanding circumstances. The blade can be angled 25 degrees to the left or right for moving earth away from the operator’s path, and can also be adjusted for working on uneven terrain when slope grading and preparing trenches for utilities. The dedicated dozer circuit ensures steady and precise dozing, even when digging, swinging or travelling. The ED160 Blade Runner also features Kobelco’s innovative iNDr (Integrated Noise and Dust Reduction) system, which promotes extremelylow noise levels for enhanced operator comfort. In addition, the system also achieves exceptional engine cooling via a high-density mesh filter, which helps to remove dust from the air intake and prevent clogging, ensuring consistent engine reliability. In addition, the hydraulic excavator features Kobelco’s short rear swing(SR) specification for excellent maneuverability in tight spaces – itscompact design ensures efficient operation on job sites where space is limited. Curved track shoes support easy manouevrability, while the reinforced undercarriage and uprated travel motor enables the machine to cope with difficult terrain. The machine features a Stage 3B-compliant engine, which helps to reduce NOX emissions. This powerful engine, combined with a large-capacity (200-litre) fuel tank and excellent fuel efficiency delivers impressive continuous operation with fewer fill-ups. The Eco-mode function also helps to ensure low fuel consumption and economic performance. Operator comfort and easy maintenance were also key considerations in the development of the ED160 Blade Runner. The large, comfortable ROPS-compliant cab provides ample space and legroom for the operator, and the door opens wide for easy access. The machine also providesexcellent all-round visibility with its large windows to all sides of the cab, enhancing the safety of the operator and their colleagues while on busy job sites. The large LCD multi-display colour monitor is fitted as standard and enables the operator to check the full range of machine status data including fuel consumption and maintenance from inside the cabin. Air conditioning, AM/FM radio, spacious luggage tray and cup holder adds to overall operator comfort. 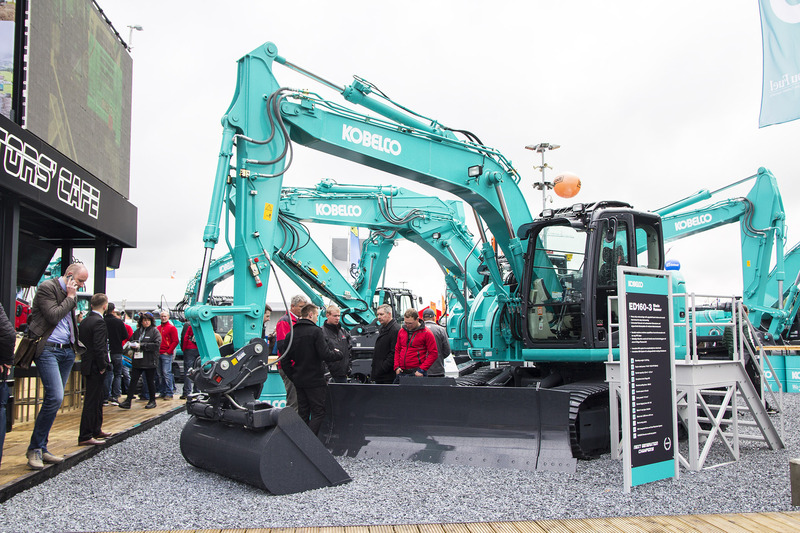 Production of the Stage 4-compliant Kobelco ED160-5 Blade Runner will start in May 2016 to arrive in authorised dealers across Europe during the summer. Its predecessor, the ED160-3 and its younger brother, the SK140SRLC-5, will both be on display at Bauma 2016. For full machine specifications and an easy-to-view directory of the European, Russia & CIS and Maghred Kobelco dealer network visitsandbox4.dutchwebdesign.nl/kobelco-europe-new.